Their study, published in Nature today, uncovered a brand new protein complex in cells that shields broken DNA ends and controls the way in which it is repaired. The landmark study was a result of collaboration between the University of Toronto, The Institute of Cancer Research, London, The Netherlands Cancer Institute and the University of Bern. PARP inhibitors are hugely promising treatments because they take advantage of a major vulnerability of some cancers—a weakness in the ability of cancer cells to repair their DNA. Traditional platinum-based chemotherapies are also being used in a more targeted way to take advantage of DNA repair weaknesses. The PARP inhibitor drug olaparib is approved in the US and Europe for treating ovarian and breast cancers with BRCA mutations, and looks promising against some prostate cancers—so the results could have a wide impact on cancer treatment if mutations in the 'Shieldin' complex are shown to lead to treatment failure in the clinic. 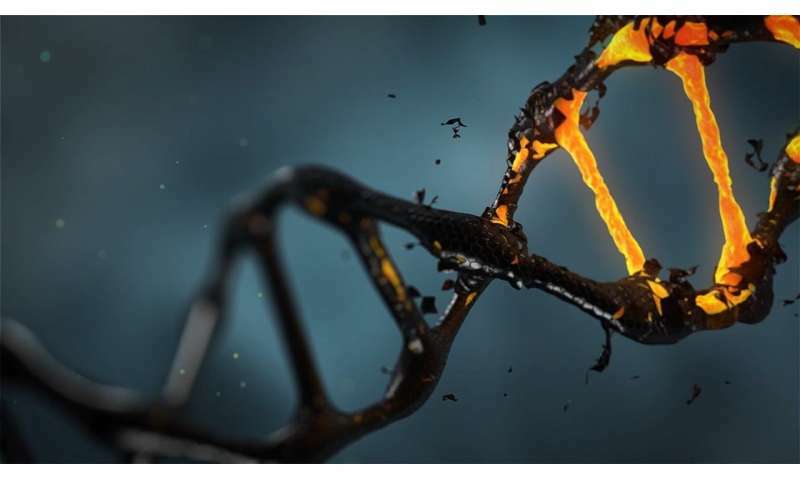 In healthy cells, the complex was found to attach to the ends of broken DNA so that the 'blunt ends' of the DNA have to be stuck back together directly—a quicker, messier way of repairing DNA that can sometimes be necessary for making antibodies during immune responses. When the researchers introduced mutations into the Shieldin complex—which stop it from forming and protecting broken DNA ends—cells are free to repair DNA via a different method, and this means PARP inhibitors are no longer effective. "This exciting study has revealed a vital new player in DNA repair—a weakness in cancer that is a key target of exciting precision cancer drugs. It takes us a big leap forward in our understanding of how cells repair DNA—a fundamental process of life, and one which could have important implications for cancer treatment."